Congratulations to brit.otto, giveaway winner! About a year ago I featured Melanie Brauner of VERSO Jewelry in Washington state who is a professional papermaker, bookbinder, letterpress printer, fiber artist and metalsmith. As you might imagine, a variety of handmade items results from her long list of interests, but today I'll be focusing on the very special abaca paper and metal jewelry she creates. Delicate in appearance yet surprisingly strong, it is made by suspending abaca fibers in water and casting them, layer by layer, onto wire forms over a period of several days. Sometimes Melanie colors the paper with teal or indigo dye and rust. 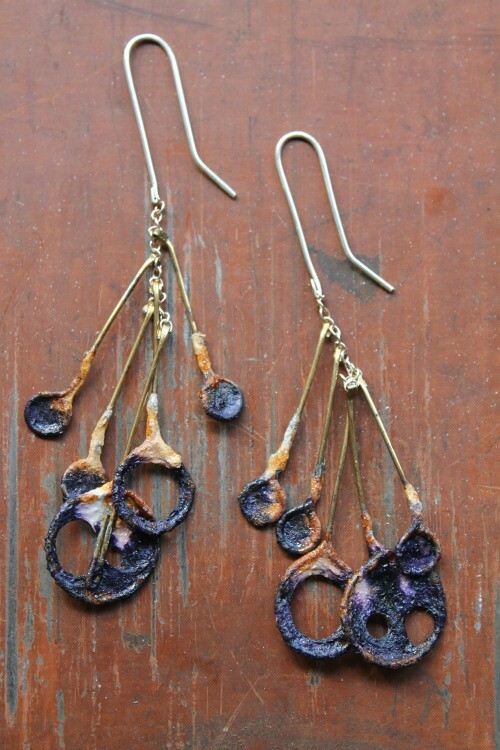 Moss Earrings - Dip-cast abaca paper and brass flowers, dyed with teal dye and rust. 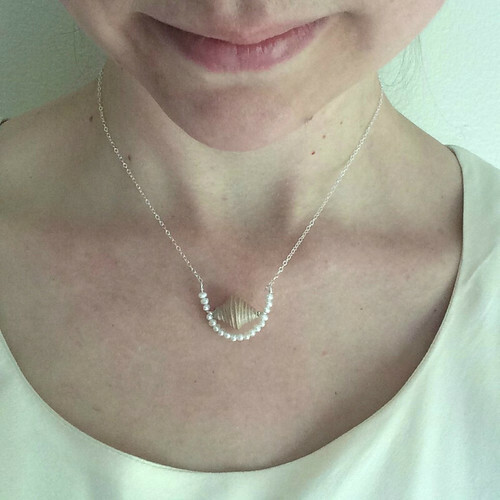 Sterling silver drops with freshwater pearls. Sterling silver earwires. The fibers cling to the wire and shrink as they dry. Repeated dippings cause the formation of a tight paper skin. Dewdrop Necklace - Dip-cast abaca paper and brass and copper beads, amazonite, sterling silver 34" chain. Melanie then combines these sculptural forms with silver findings and freshwater pearls or amazonite that result in wearable art jewelry. 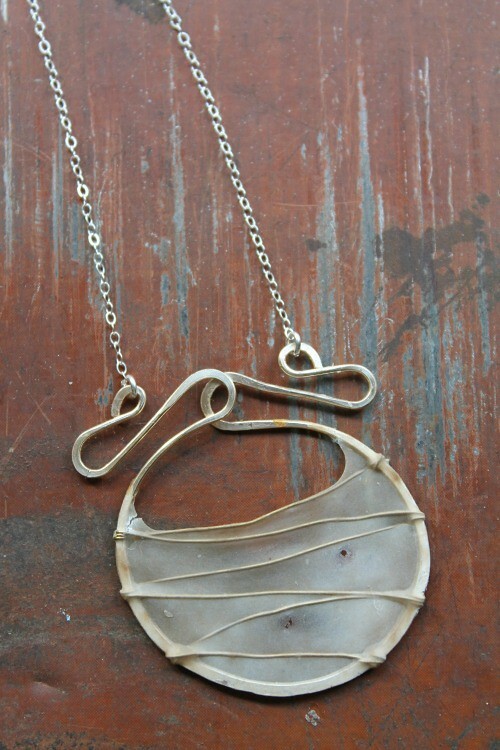 Gate Necklace - Dip-cast abaca paper and brass pendant, sterling silver 30" chain. There is no question each eye-catching piece is unique and will draw questions from curious onlookers. Meteor Shower Earrings - Dip-cast abaca paper and brass drops, on a sterling silver chain and earwire. The paper is hand-dyed in with indigo dye and rust, then sealed. Melanie likes that people have the opportunity to learn about papermaking when they are introduced to her jewelry. Creek Bed Necklace - Handmade copper and dip-cast abaca paper bead, freshwater pearls, sterling silver, 16" chain. The two jewelry pieces seen below are her best-selling items. 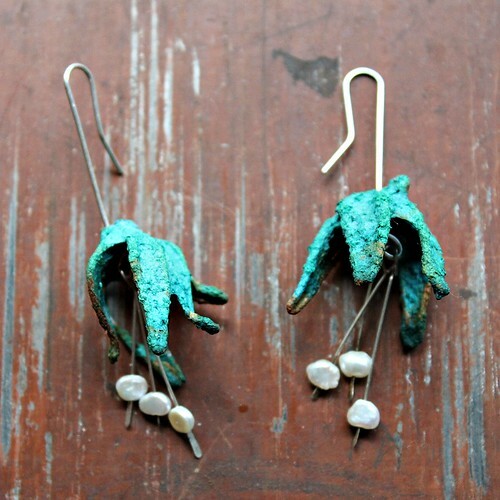 The graceful Pistil Earrings feature dip-cast abaca paper, brass bells, freshwater pearls, and sterling silver. The Riverbend Necklace is an undulating pendant of copper wire that has been dip-cast with abaca paper. It hangs from a 30" sterling silver chain. 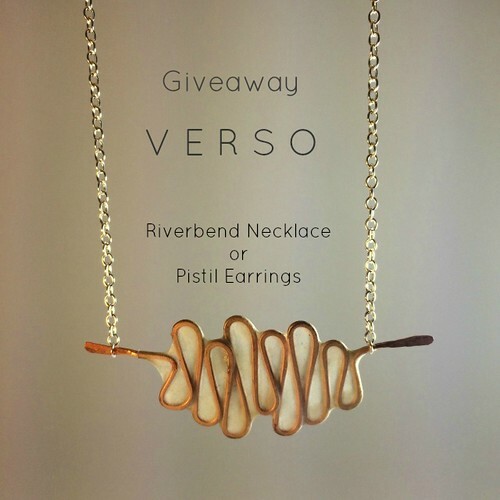 Melanie will be sending either a pair of Pistil Earrings or a Riverbend Necklace to one lucky winner. This in an international giveaway! 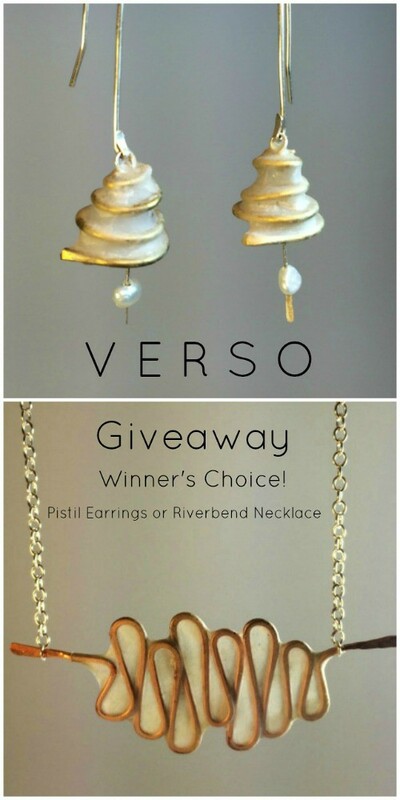 To enter, post a comment below in which you name your choice of either the Riverbend Necklace or Pistil Earrings. Be sure to include a way to be contacted within the text of your comment as Blogspot unfortunately doesn't show its bloggers the entire comment form. For those who would rather not post a visible email address, comment here and send me a quick message at ann.b.martin@gmail.com so I will be able to contact you if your name is drawn as the winner. If you are on Instagram, you have the option to earn an extra entry by visiting the giveaway photo and following directions. The winner will be announced at the top of this post and on the IG giveaway photo as soon as she or he has been notified. Giveaway ends Saturday, April 2, 2016. VERSO Jewelry is also on Etsy (VERSO Studio), Instagram and Pinterest. These are so so beautiful!! And wow at the talent. I don't know how to even pick one over the other but I am going to say the Riverbend Necklace. That's a hard choice - they are both beautiful. I think I would love either, but will pick the necklace on a coin toss! The pistil earrings are tres chic! This jewellery is both unique and beautiful. I would love a a riverbed as I don't have pieced ears. Wow. Love the movement and pearl in the pistil earrings. What beautiful work! It is very difficult to choose, but I would love to wear the necklace. Thank you for the opportunity. The work is very unique. The idea of creating with paper! I love the pistil earrings and choose them as my favorite. Oh my goodness! Every single piece is gorgeous! They are both beautiful!!! I would pick the necklace!! The earrings are beautiful. A plus is that I only have on ear pierced and so does my sister so if I would get the earrings two people would get happy since she would get the other one. Love both pieces but it is the earrings I desire. I admire the ingenuity, creativity, and skill you show in all your work. All the pieces are great, very special work full of creativity! I will love the Riverbend Necklace if i win, am sure i will make someone very happy with such a beauty. Love the Riverbend necklace. Thank you for the chance to win. 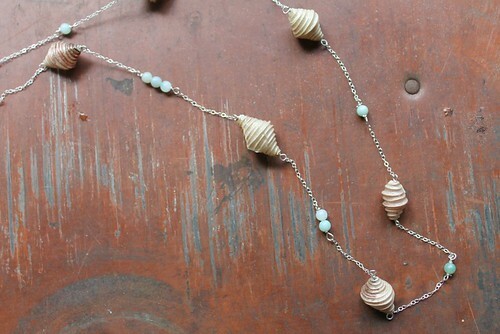 i like the Dewdrop Necklace - Dip-cast abaca paper and brass and copper beads, amazonite, sterling silver 34" chain. Stunning work. This is the first I have seen of your work but it is luscious!!! I would love to wear the Riverbend Necklace. I will email you in case I am the lucky one. I'd go with the Riverbend Necklace! Thanks so much for the chance! Love both pieces of art. If I gotta to choose one it would be the earrings... I am in complete awwww of them!!! TO own them would be special!!! I like the Riverbend Necklace, it's one-of-a-kind. Wow! I am in awe of the creativity. I would love to wear the 'Riverbend' necklace..great name. Your work is stunning. I love all your pieces, they're so unusual and beautiful. The Gate necklace is just...amazing. I'm going to run out of adjectives. I'd choose the Pistil Earrings for the giveaway. My contact email is countesschocula at mail dot com. Great work. I choose the earrings. Lovely work. I would totally wear the Pistil Earrings. Fingers crossed! Beautiful!!! I would love to have this Riverbend Necklace for me... lovely!!! Thanks Ann for introducing us to very talented paper artists! Thank you for the opportunity. I'm totally drawn to the pistil earrings, and would love to win. I love the Riverbend Necklace, but truthfully all the work is amazing! Such a wonderful talent this took to create such beautiful items. Both of these offered are equally exquisite, so this is a difficult choice. I would have to say the Riverbend Necklace would be my first pick. Thank you for giving us the chance to experience your artwork. The Riverbend Necklace is so gorgeous! The flow of the piece is not only soothing to look at, but it's a true work of art. I would love to wear this stunning creation. I love the Riverbend Necklace, it's so pretty and unique! Beautiful! I'd love the Riverbend Necklace. They are both so unique. I am really drawn to the Pistil Earrings! Wonderfull! I really love pistil earrings ! I would be so honored and proud to wear the Riverbend necklace. What strikingly beautiful atristry! Thank you all for your enthusiasm and entries for this giveaway! The winner was chosen after listing all entries, both on the blog and Instagram, into a numbered list and entering the total number into the auto-calculator at random.org. Stay tuned for another equally lovely giveaway coming up in a few weeks.